The GC0388-D industrial sewing machine, from the Highlead range, is designed to stitch medium to heavy weight materials. It features a top feed walking foot and bottom feed system that is suitable to sew materials such as leather, synthetics, canvas, plastics, technical textiles, webbing, upholstery, tarpaulin + heavier than normal standard fabrics. The balanced sewing machine head benefits from automatic lubrication to reduce wear & tear, resulting in improved durability, lower noise levels, smoother running and minimal maintenance costs. A top mounted adjusting dial allows the operator to easily set the top feed walking foot to suit a particular application. This is useful when switching between materials, applications, thicknesses etc. and allows the GC0388-D to be more versatile when compared with older style fixed walking foot models. The machine is equipped with a automatic thread trimmer which is mounted under the needle plate for quick & accurate cutting of thread at the end of a sewing cycle. This saves considerable time when compared with manual cutting of threads using scissors. The thread trimmer is electronically controlled and uses electric impulse solenoids to move the cutting knives. The position of the needle is controlled by an electronic needle position motor & controller. This will automatically put the needle in an UP or DOWN position at the end of a sewing cycle: reducing the need to use the manual hand wheel. The fitting of a large hook & base as standard, reduces the number of bobbin changes and helps when using the thicker threads associated with heavier materials. A large stitch length is available up to 8mm and a high foot lift of up to 16mm offers good clearance when stitching bulky/heavy items. 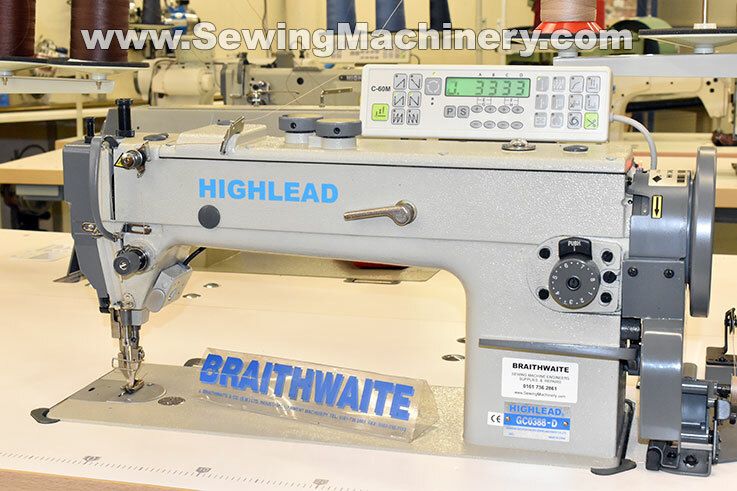 The Highlead GC0388D is a feature packed heavy duty machine and as well as the higher/longer arm and automatic thread trimming, it comes as standard with programmable auto back-tack, auto reverse, knuckle quick reverse and built in stitch program module. It is fitted with a full sized quiet & energy efficient electronically controlled heavy duty motor, which only runs when you are actually sewing; If you pause or stop: the motor stops immediately and is almost silent. A time proven Mitsubishi licenced electronic control system is utilized for operation of the automatic devices, including the thread trimmer and servo motor. The GC0388-D is a general purpose walking foot machine with thread trimmer, for use on medium to heavy weight materials and is suited to sewing, for example, car seats, general leather articles, belts, canvas, tents, awnings, handbags, outdoor wear, camping goods etc.